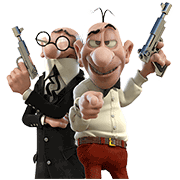 http://www.line-stickers.com/ – Mortadelo & Filemon: Mission Implausible Line Sticker | The most hilarious secret agents ever have just arrived to LINE, right from their latest motion picture: “Mortadelo & Filemon: Mission Implausible.” Mortadelo and Filemon are back with a new batch of stickers so crazy, even crazier, than the last one. Available till December 31, 2015. Publisher : Zeta Cinema S.L. Copyright : © 2014 Zeta Cinema S.L. Next post Shamitabh – It is Mixture!